So as I am busy packing and moving home, fever sweeps over the nail community! Avid readers may remember this comment on my Zoya Posh post... 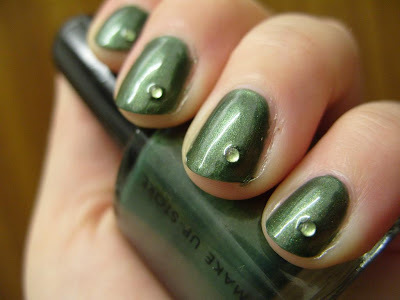 I requested Zoya make a dark green version of "Posh" - Art of Beauty commented teasingly "Your wish may just come true?" They're weren't joking!! 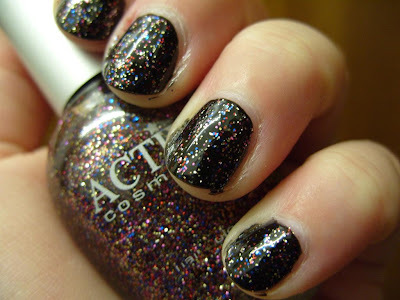 Check out the scoop on All Lacquered Up! 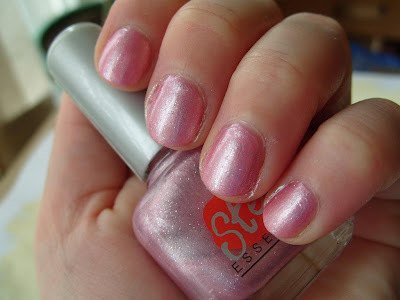 While I am here, please find enclosed my NOTD, Barry M "Baby Pink".  It's a really pale opaque pink, super-glossy with good drying time. Not my usual bright self but I just BubbleWhite-ed nails so wanted something pale! This is 3 coats. I better be off, got stuff to do, places to go. But I will be back soon! I love this polish :) I had a bottle, then it broke hideously and for 6 years I have been searching for a new bottle, and by accident I found it on ebay with it' s sister colour "Climax" and I already have some of the other colours from the same collection. I'm off to have some hot chocolate and watch Chuck before bed! 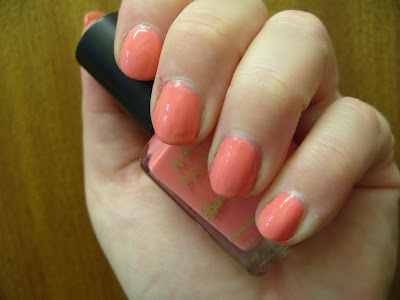 NOTD: Barry M "Pink Flamingo"
Sometimes, you buy nail polish for the name. I know I shouldn't but I do... So when I saw that Barry M had a new colour and it was called "Pink Flamingo" I had to have it. Even more so when I actually saw it in the shop! It's an amazingly vibrant pinky-coral, so hot it melts the iciest of hearts (like my brother's, he said 'for once, the nail polish kinda looks cool'). This is 3 coats over Seche Clear base coat and Sally Hansen MegaShine top coat. I survived my hair cut so I bought these as a treat :) These and the new "Pink Flamingo" nail polish from Barry M - it's such a unique colour and is SOOO hot!! 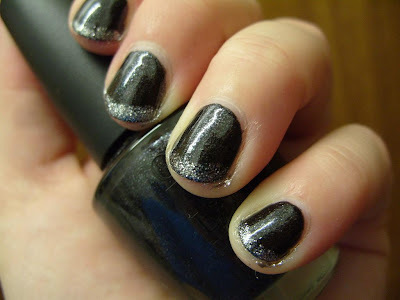 Stay tuned for a NOTD with this tomorrow night. I got soaked by rain coming out from the salon so pix tomorrow when I can do my hair again. 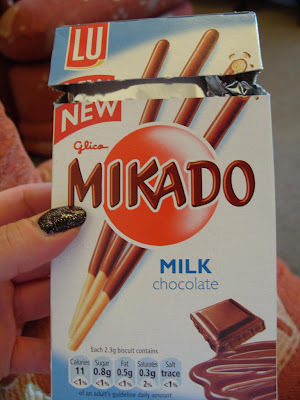 Mikado stick biscuits are sooo good and it has the a really funny advert I can so relate to, check it out! In other news, I have been packing up all my stuff for my move next Sunday, and I reorganised my stash of nail polish and divided them up into brands :) I have a heck of a lot of China Glaze, Zoya, Nails Inc, Swedish brand Isadora and Rimmel London! I'm off to make some coffee before I settle in front of TV for some well-deserved relaxation! I have issues with getting my hair cut. I don't know why. It just makes me so incredibly anxious and tomorrow it's time again (I get perhaps 2 or 3 hair cuts a year due to this...) Anyway, I needed something sparkly to divert my attention while the hair lady does my hair. 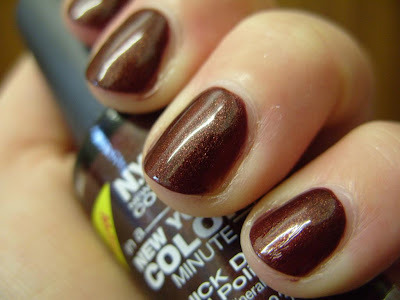 NOTD: New York Color "Canal Street"
I have a craving for brown shimmers at the moment, don't know why. I'm still looking for Jessica "Expresso" I guess :) I picked this up on special offer about a month ago or so. 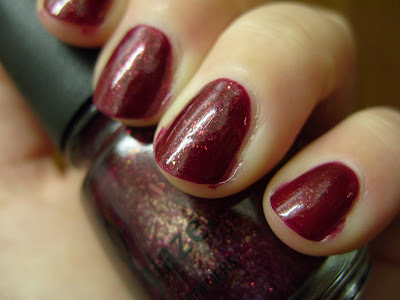 It applies really well and dried very quickly, as one expects from a quick-dry polish. This is two coats with Sally Hansen Megashine top coat. It is a deep brown shimmer with a sort of hint of gold sparkle. I'm loving it! :) I suppose it's more of an autumn colour, but it's been raining here for about a week so I guess I'm getting into the autumn mood! I wasn't up for doing anything today other than sit on the sofa and look through my boxes (yes, that is plural...) of nail polish to start wrapping them up for moving. I didn't have the energy to start actually wrapping them all, but I did find a nail polish I needed to put on! This is one coat of the H&M over a coat of Barry M Bright Pink (as the H&M is a bit sheer). I love the Barbie pink metallic base and supersparkly silver microglitter! This was a quick NOTD last night, still unwell, so I didn't feel the creative juices flowing at all. I decided (unwisely) to make a French tip with China Glaze "Tinsel". Messy and it made my nubs look more stubby and this morning I woke up with imprints of my sheets on the tips as the tips were not properly dry :-/ Worst NOTD in a long time. Oh well. Off sick today with the same upset tummy I've had since last week and don't have the energy to do anything but sit on the sofa. I will go through and start packing up my nail polishes, and take some pictures of the growing stash. It has gone a bit out of control as I'v not logged any of my new acquisitions for months. I will re-catalog everything once I've moved. 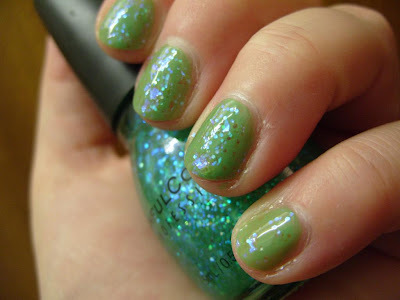 NOTD: Sinful Color "Green Ocean"
I love how "Green Ocean" look in the bottle but as with most glitters, it's a bit tricky to apply in large quantities. I did "Green Ocean " over 2 coats of Orly "Mint Mojito" but I think that I will choose something more blueish next time, such as Barry M "Mint Green", this doesn't really go with my skin tone. I am busy packing just now and I had my nails bare since soaking off Wet n' Wild "Sparked", but I felt I needed a lick of polish to protect my nubs. 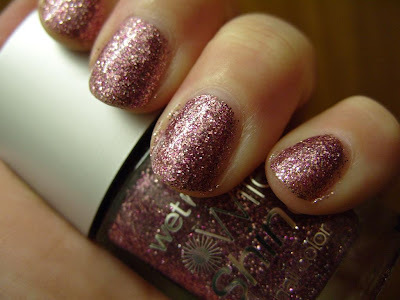 NOTD: Wet n Wild Wild Shine "Sparked"
This will be a very short post as I have had a rubbish week; I am feeling really ill right now due to stress (hopefully!) so this sparkletastic polish was just what I needed after a 12hrs working day! This is my first choice from the new China Glaze collection for autumn, Retro Diva! 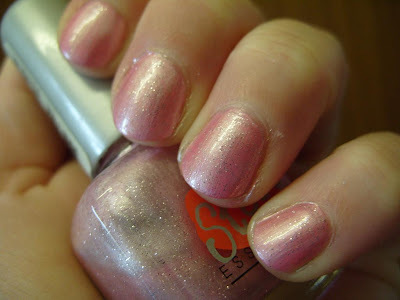 I've seen some lovely swatches of it on other blogs, but my camera doesn't like it. Perhaps it's too dark for it to pick up all the glowy glitter particles? It's a deep wine, jelly polish with irregular glass flecks of gold. It looks very regal indeed! This is 3 coats over Nailtek II with Sally Hansen MegaShine top coat. The formula is ok, I did 3 thin coats with plenty of drying time (4 mins between each layer) as to avoid bubbling. I've seen plenty messy polishes; this is OK in terms of mess. China Glaze keep pumping out colours I love! I really like "Stroll" and I didn't have the application problems I keep reading about. Perhaps it is a combination of base coat and polish that is to blame for formula problems? This is an old polish, I think it might be about 10yrs old or thereabouts. I only have two of Makeup Store nail polishes, this green and a pink sparkle called "Hypnotic". They're both from the same era. I am not sure if they are Big 3 Free but I doubt it. This is 3 thin coats and rhinestones then 1 thick coat of Sally Hansen MegaShine. I've not got a dupe for this - it's not as warm in the tone as some of my other greens. 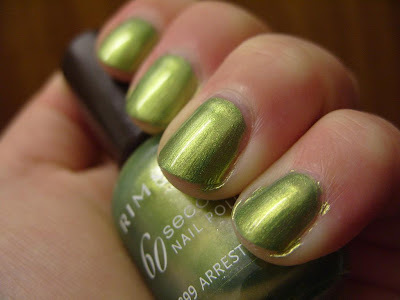 It has subtle gold/lime shimmer, so I chose rhinestones to match this metallic shimmer.